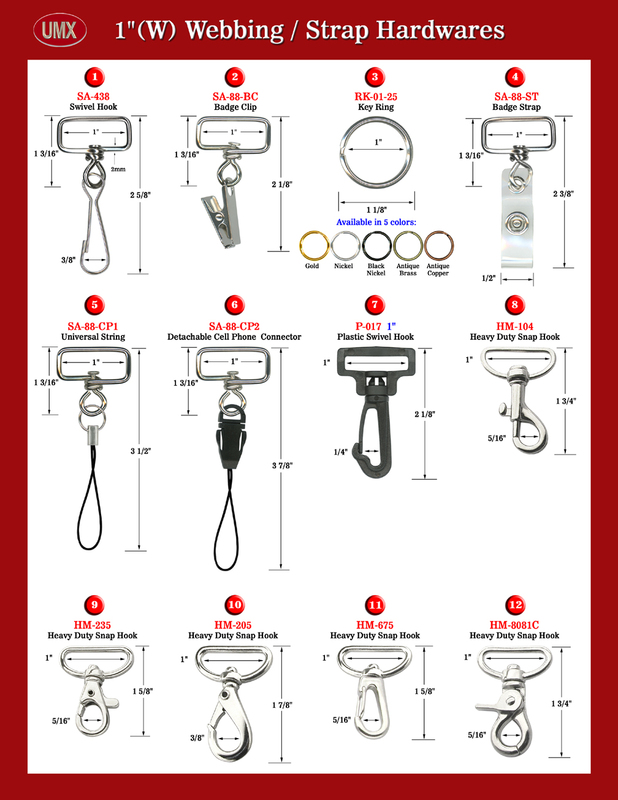 The following listed photos of metal, plastic or rubber hardware are most commonly used hardware attachment for making 1" heavy duty nylon, cotton or polyester straps for lanyards or leashes. Our standard 1" lanyards or leashes come with (-HK) swivel hooks, (-BC) badge clips, (-O) split key rings, (-ST) badge straps or (-CP) universal cell phone strings. Depending on your application, we provide more optional hardware for your selection. Just tell us the size of lanyards or leashes and the number of hardware as listed below then we will make it for you. You can buy the individual hardware to make your own lanyards too. Please check other web pages for pricing. We still have a great selection of hardware not listed yet. If you didn't find the hardware listed then just give us a call or email us your request! You are viewing Lanyard > Making > Handy Photos of Lanyard Hardware For Making 1" Heavy Duty Nylon, Cotton or Polyester Strap Leashes or Lanyards.